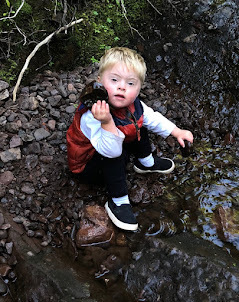 A little boy with Down syndrome grows up on the shores of Lake Superior: throwing rocks, sniffing flowers and following his curiosity. I didn't forget about you. I was just tricked. My weather app told me that my 270 mile drive was going to be cloudy today, but it was wrong. It snowed the whole way. Nothing I'm not used to, but an extra hour added to my 5 hour drive was a bit of a stressful surprise. So guess what. I don't really have a blog for you today. I am home at Grammy and Grampy Wais' safe and sound with my little Brady P. We are going to give kisses instead. Brady P. The rock hound. Little Braeden Philip (Brady P.) entered this world with wise eyes, a tender heart and Down syndrome. He was born to a loving mother and father, a wonderful extended family and a supportive community. As luck would have it, he gets to grow up on the shores of Lake Superior in beautiful Copper Harbor, Michigan. Full of lakes, streams, trees, rocks, flowers, hills, animals and wonder all around, this place is a gift for a little boy to follow his curiosity, find his passions and enjoy a great quality of life. And he is a gift to us all. As his mother, I am pleased and proud to share our journey of nature, development and defying the odds.